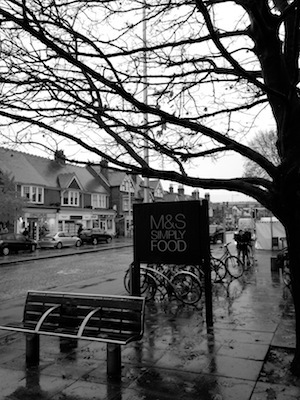 Maybe the weather put me off the wines… oh well, at least the food was good! My local M&S hosts wine tastings every couple of months and November is the perfect month to pitch one aimed at pimping Christmas wines to an eager public starting to think about the necessity of such things. Well, maybe it’s the food hall location or that fact that the shops still busy catering to it customers at the time, but these tasting always come across as a little awkward. More than anything I blame the food, it’s awesome… and there in lays the problem. When your at a wine tasting and pretty much every wine there is overshadowed by the food it’s served with, you’ve got a problem on your hands. The extraordinary has a way of rendering the above average, inert and most of the wines shown on this particular evening were simply out classed, having their weakest aspects exposed… at least, that’s how it seemed to me. Not that this is bad thing… far from it! From the punters point of view it’s all win-win, I’m just not sure it’s the message M&S was hoping to send out. 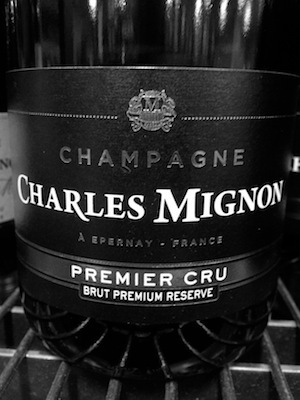 Solid Champagne, but you’d never know it was ‘Premier Cru’ unless you saw the label. I have something of a love/hate relationship with Champagne… I love champagne but hate the price and this particular bottle is a classic example of why. It’s a perfectly serviceable Champagne… but for £32 a bottle I don’t want ‘serviceable’ I want ‘ridiculously good’ and this about generic as they come. Pale lemon colour, mineral citrus lemon and toasty brioche aroma; leading to a concentrated lemon attack with bright acidity that dominates the palate. The mousse is fine and the finish medium in length and clean. Apart from the wasted promise of the toasty brioche on the aroma, this is a fairly one-dimensional Champagne. 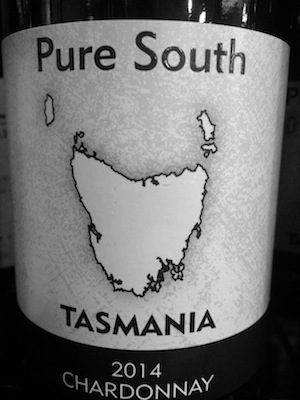 In its defence briefly… It is well made, well balanced and does come across of self-assured. Shame about the complete lack of personality! Just goes to show… Premier Cru or not, you can still take the best fruit and make a boring wine with it. If this was £20 a bottle and on sale for £15 or less I might think about picking some up, but as it is it’s way over priced. Good concentration of fruit… but extreme acidity way out of control. Most wines will be hit or miss with a wide enough selection of people, but this wine was a close to a universal miss as I see before. It was billed as a Burgundian style white akin to Chablis… but it’s like someone read a basic description of Chablis and tried making one without ever tasting the real thing. It has a pale lemon colour with clean fresh citrus (lemon flesh) and tropical (melon) fruit aroma; with a stony minerality lurking within it. Citrus fruit assaults the palate with powerful concentration and an unrestrained acidity… Like a fish slap to the face! To give this wine some credit, the concentration of fruit is impressive… but the acidity is way out of control. It’s a textbook showcase for why balance is important in a wine and a cautionary tale for what happens in its absence. Steer clear… unless you’re looking for the perfect wine to match with a lemon wedges and a pinch of salt… Tequila style. Best wine of the night by a country mile… by one of my favourite South African wine makers, Adi Badenhorst. This was, hands down, the best wine of the night and the only one to hold it’s own alongside the yummy food from the M&S deli. Which was something of a relief as its made by Adi Badenhorst, one of my favorite South African wine producers. I’ve reviewed his ‘Secateurs’ Chenin Blanc on the blog already and will probably talk about his other wines in due course as well. 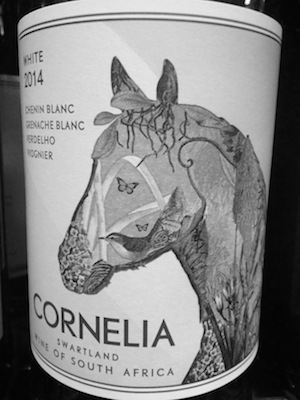 This wine has something of an eclectic blend within it… 60% Chenin Blanc, 15% Grenache Blanc, 15% Verdelho & 10% Viognier. It has a pale lemon colour with a green hue and a joyous fruit salad aroma of fresh pear, pineapple, apple, peach and nectarine all wrapped up in yeasty lees aromas. On the palate there’s concentrated lime, peach and pineapple with a bit if gooseberry thrown in for good measure. There’s a literal riot of fruit at the forefront of this wine but it’s framed with the lush chewy almost buttery texture that Viognier is so known for and the finish is long and rewarding with hints of herb creeping in at the end. With wines like this available for £10 a bottle, you can see why I was so annoyed with the first two. Standard entry-level Bordeaux with teeth pulling tannins but lacking the fruit and acidity to soften them through ageing. This classic Bordeaux blend (40% Cabernet Sauvignon, 30% Merlot & 30% Cabernet Franc), was a decent example of an entry level Bordeaux… I’ve had much better but also a lot worse over the years, but beware; this is young and possesses some teeth pulling tannins. Deep ruby colour, just starting to go brick tawny at the rim; with soft ripe red berry fruit aroma (red cherry, cranberry & redcurrant) and a touch of slate minerality from the Cabernet Franc peeking through. Young astringent powdery tannins fill the palate, begging for rare red meat to soften them alongside the ripe red cherry fruit and the dry savoury biscuit dimension that unfolds throughout the finish. This was average at best and while it’s worth its £12 price tag, this has more to do the pricing of wines in Bordeaux than any really value assessment… compared to most new world wines around the same price tag, it’s distinctly lacking and very much a food wine due to the tannins. I wouldn’t think of ageing this either as it doesn’t really have the acidity or fruit concentration it would need. This is a good little Southern Rhone classic… let down by the fact that I can get exactly the same wine cheeper at the Co-op under a different name! This is M&S’s labelling of the ‘Ogier’ series of wines. Lirac is a village in the southern Rhone on the opposite side of the river from Chateauneuf-du-pape and tends to produce wines that are similar but softer and a shade or two lighter. This one has a deep ruby colour with purple black core, ripe black fruit (plum, blackcurrant) and soft faint vanilla aroma. Concentrated blackberry and blackcurrant fruits lead the palate with pastel chalky minerality and a hint of liquorish peeking through. 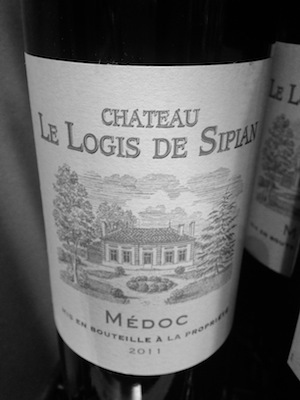 Tannins are soft and balanced perfectly with a decent acidity and the weight of the whole. This blend of Grenache, Syrah, Mourvedre & Cinsault is nice enough, though as with the Bordeaux above, I have had better for the price. 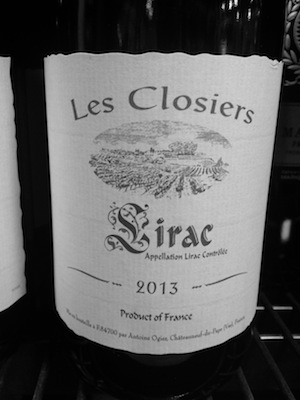 What I’m not too sure on, however, is how exactly this is different from the Ogier Lirac available from the Mighty Co-op… they are made by the same producer and though I have yet to try them side by side, I suspect they are exactly the same wine. So save your self a quid and buy from the Mighty Co-op instead for £9 a bottle if not for considrably less on offer. And that was it for the tasting… well; there was also Madeira that tasted like a cross between tawny port and sherry, but the less said about that the better! 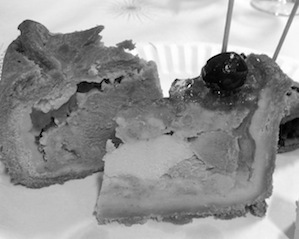 So I’ll leave you with a photo of the star of the evening… The M&S deli counters majestic pork pie (and limited edition Christmas game pie). With the exception of the ‘Cornelia’ white blend by Badenhorst, these pork pies were the star of evening.